This dress features beautiful metallic knit fabric. 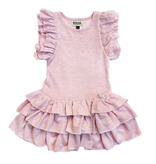 It is a drop-waist dress with ruffle flounces around the armholes and the skirt. Simple and chic!